March 17th - Featuring St. Patrick's Day Freebies! 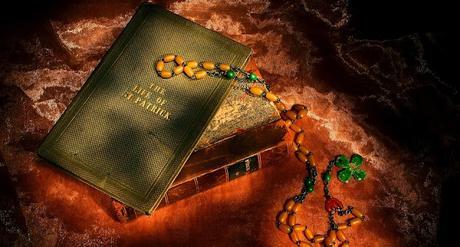 -- In honor of the Patron Saint of Ireland, who brought Christianity to the Emerald Isles, as Ireland is commonly known. It is truly a day of celebrating Irish history, ancestry, traditions, and customs. Did You Know? Over 34 million Americans are of Irish descent - almost nine times the population of Ireland! -- Natasha Wing puts an Irish twist on a Christmas classic. It's the night before St. Patrick's Day and Tim and Maureen are wide awake setting traps to catch a leprechaun! 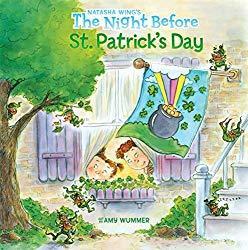 When they wake the next morning to the sound of their dad playing the bagpipes and the smell of their mom cooking green eggs, they're shocked to find that they've actually caught a leprechaun. But will they be able to find his pot of gold? 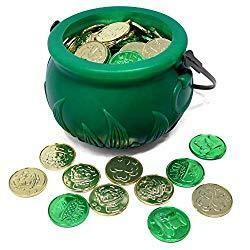 • Saint Patricks Pot of Gold -- Super Value with 208 Pieces St Patrick's Day Shamrock Coins in four Designs of Shamrock, Hat, Lucky Coins and Leprechauns. Also comes with one Large Green Cauldron with Handle. Perfect for St. Patrick's Day Party Supplies, Birthday Parties, and Saint Patricks Decorations. Ideal for Family and Friends Getting Together and Having Fun. 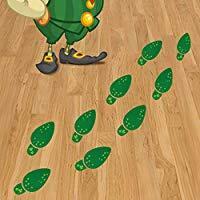 • Leprechaun Footprint Floor Clings -- Just follow these footprints to the leprechaun's pot o' gold! These leprechaun footprints can help you have an unforgettable St. Patrick's Day party, giving you different feelings to enjoy this holiday. Wish your friends a very cheeky Happy St. Patty's Day by leaving this surprise for them to find.  85 beautiful printables to use THIS St. Patrick's Day! - Green Beer Day is a holiday celebrated by students at Miami University in Oxford, Ohio. It is often thought to be the best event which takes place during the school year. The holiday began in the early 1950s when the United States was experiencing grain shortages after World War II. A 1952 Miami University Student newspaper article says students would not be imbibing dark green-colored beer due to the lack of grain available to breweries for beer production. - Celebrates the day John Philip Holland, an Irish engineer, successfully demonstrated his submarine, the Holland VI. On March 17, 1898, his submarine made her first successful submerged run, impressing observers by the US Navy Department. John Philip Holland designed submarines which, for the first time, made use of internal combustion engines on the surface and electric battery power when submerged. - Founded on March 17, 1910, in Thetford, Vermont, by Luther Gulick M.D. and his wife Charlotte Vedder Gulick. Camp Fire Girls, as it was known at the time, was created as the sister organization to the Boy Scouts of America. The organization changed its name in 1975 to Camp Fire Boys and Girls when membership eligibility was expanded to include boys. - Stephen Perry, of the rubber manufacturing company Messers Perry and Co., invented the rubber band to hold papers or envelopes together. On March 17, 1845, Perry patented the rubber band. These first rubber bands were made of vulcanized rubber. - Trust isn't just a warm and fuzzy feeling – it can result in serious health benefits. Patients who trust their doctor are more likely to take their medication, more likely to go in for follow-up care, and more likely to have their health needs met.